"My Aspergers son has a terrible time getting to sleep, but then in the mornings, I have a terrible time getting him up and out the door for school. Any suggestions?" Unfortunately, it seems that virtually all kids with Aspergers (High-Functioning Autism) are likely to suffer from disturbed sleep patterns at some point or another. Sleep problems can be divided into three main categories: (1) settling problems, where the youngster has difficulty going to sleep at the appropriate time, (2) waking problems, where the youngster wakes repeatedly during the night, and (3) arousal problems, where the child has a hard time waking up in the morning due to such a restless night. 1. Allergy and food sensitivities: Kids with Aspergers are perhaps more likely than their peers to be sensitive to foodstuffs (e.g., sugar, caffeine, additives, etc. ), which can keep them awake. If your youngster frequently has sweet or caffeine-rich drinks and foodstuffs near bed time, then it is worth checking whether this could be disturbing his sleep. 2. Medication: Medical interventions are typically seen as a last resort in treating sleep disorders in kids because they can be habit-forming and do not treat the root cause of the problem. As a general rule, it is better to minimize the medication your youngster is on, but at certain times it may be desirable to have a mild sedative on hand (e.g., going on vacation). Some moms and dads have also found that using medication in tandem with a behavioral approach can help to restore a good sleep pattern. The combination is crucial, because without the behavioral intervention when the medical treatment ends, the youngster is likely to return to his old sleep patterns. 3. Melatonin: This is a hormone secreted by the pineal gland which has been shown to regulate sleep patterns. In kids with Aspergers, their patterns of melatonin secretion may be irregular, so it is not that they don't produce it, but that they don't produce it at the right times of day. Some foods are rich in melatonin (e.g., oats, rice, sweet corn, tomatoes, plums, bananas and Brazil nuts). 4. Natural remedies: Many of the natural remedies available from health food stores are supposed to treat insomnia and other sleep disorders. These may have similar effects to conventional medicines but carry less risk of side-effects than conventional sedatives. You could also try contacting a homoeopath. 5. Removing stimulants from the diet: Changing your youngster's bedtime routine can be stressful, and if they are used to having certain drinks or snacks near bedtime, suddenly switching to something different may be counter-productive. However, you could change to decaffeinated drinks, replace ordinary chocolate with sugar-free chocolate bought in health food stores, use carob powder to replace cocoa and chocolate, switch to sugar-free drinks or replace sugar in drinks with sweetener or fruit sugar, which may help some kids. Alternatively, you could try gently phasing certain foods out over a period of days or weeks so that your youngster is consuming less and less sugar and caffeine overall without having anything suddenly taken away from them. 6. 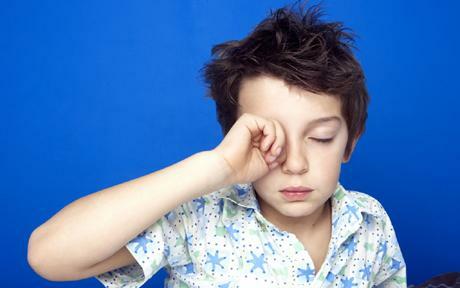 Lack of social sense: Kids with Aspergers may have difficulty understanding why and when they need to sleep. Problems with social cueing (i.e., learning why and in what order things should happen) are common in Aspergers, and this may mean your youngster doesn’t make the connection between his family going to bed and his own need to sleep. 7. Establishing a routine: Kids with Aspergers respond well to routine and structure because it allows them to feel safe and in control. Whatever routine you try to impose needs to be something you feel comfortable implementing and that your family can agree on. It may take several weeks for it to alter your youngster's sleep patterns. It can help to present this routine visually, using a timetable for example, so your youngster knows exactly what to expect, including getting up in the morning. If the routine needs to be altered, it can then be explained visually. It may be that your youngster's timetable needs to be more detailed so that he is told exactly what to do when going to bed, for example, draw the curtains, get in to bed, turn light off, lie down, pull cover up, etc. It may also be worth setting aside some time to prepare for the next day in the routine. This could include getting the school bag ready or making a list/timetable of things that need to be done the next day. Adding a few drops of lavender oil to your youngster's bath or pillow. Giving your youngster a massage. Introducing an hour's quiet time before the youngster's bedtime. Providing the youngster with a set time to talk about their day or their worries as part of the evening routine. Physically exhausting your kids is a good way of ensuring that they sleep! Many kids with Aspergers enjoy rough and tumble play, and although this may seem to be the opposite of the points made above regarding quiet time, it might be more effective for some kids. Relaxation aids such as music and yoga can be very useful. Some moms and dads have reported having lighting (e.g., a lava lamp) in the bedroom can be helpful. It’s worth considering if smells in the room, or coming from other parts of the house, may affect children with heightened senses. Some kids are exceptionally sensitive to light, so sleeping when there is even a very dim light on could be very difficult for them. Putting up thick curtains will block out as much light as possible in your youngster's room. Some moms and dads have found that their kids can be woken by very slight sounds at night. Ear plugs, or music playing on headphones, could be used to block out noise for those kids who are comfortable with wearing these. The layout of the room may need to be adjusted. Although it may be comforting for some kids to have lots of their belongings around them, it may serve to be quite distracting for others. Even the colors of the room or pictures on the wall may be disturbing. Touch sensitivity is extremely common in Aspergers. Some kids experience certain types of touch as physical pain. Labels on bed clothes and different materials can also be uncomfortable. Some kids respond well to a weighted blanket, which is made from thick blanket material like a quilt with the pockets filled with beans. 10. Keeping a diary: If you think your youngster may have a sleep disorder and you want to get an idea of the extent of the problem, it is a good idea to keep a sleep diary as the initial step to solving the problem. If you decide to try any routines or behavioral modifications to help your youngster to sleep, then the sleep diary will allow you to see if what you are doing is working consistently, sporadically or not at all. We are using the Meletonan....Our Aspie son's doc recomended it. Welcome to my world lol. If you find help, let me in on the secret! my son just doesn't want to wake up in the a.m., he sleeps fine at night though. Melatonin changed my son's life and ours. He's 7.5 now -- we started it a few months ago after trying many of the other strategies. Bed times are no longer loaded, stressful times for him. Or us. Travel is so much easier. Mornings are better. 1mg at bed time. Melatonin is not licened in the uk for children and my gp will not give it to us. I am just wondering about how to "position" a discussion with my son regarding his medications. My son (age 9) has been taking medication for his ADHD since he was 5 years old. As a result of his ADHD medication, we give him Melatonin at night to help him settle in. He has trouble settling and waking, with the occasional waking during the night. I am concerned that in the future, as he grows and gets older, that he will have a more positive view of street drugs because of the fact that he has been taking daily medication since he was very young. My husband and I have tried to frame our conversations about his need for daily medications as medically necessary, only used to help him focus, his behavior and choices are his own, and that he is under a doctor's care. However, when it comes up in conversation and I start talking about his medications, it feels like there is a fine line between perscription drugs and street drugs. He is a very literal child and I am concerned that when he is a teenager, he will have a more positive perspective of street drugs because of his long term use of perscription drugs and the added,over-the-counter natural melatonin. How can I ensure that I frame the conversation to build a more definite line between his daily Rx drug/natural melatonin and the possibility of him being presented with street drugs (when he is older). Obviously, we need to ensure that our dialogue shows a strong perspective now so he knows where my husband and I stand on the issue and that we are consistent when it does come up organically in conversation. For the UK poster - Melatonin is over-the-counter in the US. You could perhaps get it mail ordered to you from the US or Canada? I don't imagine WE regulate it any more than other vitamins. For the drug concerns: it is very important to talk about your family values to your children. Abuse of street drugs is VERY different from taking medically necessary drugs or supplements (most people don't think of it as a "fine line" between them). Do you talk about healthy eating? Well, supplements and vitamins (especially Vitamin D!) can be an important part of keeping your body healthy. There are scads of people who need prescription drugs who are not interested in street drugs. I would be more concerned with the possible ADHD tendency toward addiction than just the fact of taking prescription drugs. Talk to your doctor or other health professional about this concern of yours. Our Good Night, Sleep Tight reward chart creates the perfect bedtime routine for children. It provides a step by step routine with tips and guidelines to help you give your child a healthy nights sleep. We occasionally give our son melatonin to help him sleep on those nights he just can't settle down. Also we try to get him to bed and asleep by 9pm, because we've found that his mood is so much better in the morning if he wakes up on his own than if we have to wake him up. No one has commented on the waking part. I think this is just as important. So did the courts in my custody trial. My son would go to bed at 7:30 and wake at 7:30 to leave for school at 9:00. He walks and class starts at 9:15. Sometimes meltdowns cause him to be late or his phobia of bees on the way, or just getting distracted. But parents, did you know YOU ARE HELD RESPONSIBLE? Yep, it's true. No matter how much you try to help your child be on time or how much you communicate with the teachers, counselors, school office, principal, to find a solution, you are held accountable for your child's actions. (my son even has an IEP). Bedtime routine plays a big part in our morning success along with a structured, stress-free morning routine. With a child with special needs there is no easy fix, as I'm sure most know. We celebrate the days we have success. Our son who is now 13 will wake up in the middle of the night terrified of some noise, someone in his closet or under his bed, etc. He can't get back to sleep then and will wake up the whole house trying to get someone to sleep with him. He has to sleep with a light on and a noise machine. When he's more scared, then he has to have the hallway light on too. As a toddler, he used to have night terrors at about the same time he is waking up now every night. We are going to try Melatonin...... Hope it helps! Having same issue with my 12 yr old charge. He comes to homeschooling late,no breakfast and takes at least an ahour and half to get started.Since I do not run his home schedule and routine ,I have little control. Makes everyday harder. Melatonin has really helped my son get truly rested after a good night's sleep. He always had trouble getting to sleep, then staying asleep. I honestly have no clue besides the fact that the judge is known for ruling in favor of the father. They all pushed the issue of my son's tardies at school but it is not a new issue or a substantial change. There was nothing found (according to the judge) to change custody but in her opinion, she felt that I have done fine but that his dad was also capable. So she awarded custody to him. Judges can't legally change custody based on opinion, but she did. I'm devastated and so is my son. I have been his primary parent since birth and his dad has already says he thinks I "pushed" the dr to diagnose him. my son likes to play "got to use the bathroom" at bedtime and hangs out in there much longer than necessary. He hasn't had problems in the morning though. Melatonin is the only thing that works for my son. Try Melatonin...my 7 yr old has AS and was going to bed at 9pm and was still awake at 11:30...wide awake, hence mega grumpy all day! He is now taking Melamil as suggested by his nuerologist, and its amazing...half an hour at most to get to sleep, much better all round behaviour as well probably as not exhausted all the time. Try a homeopathic doctor, melatonin is one way of dealing with this. The problem is the cortisol levels (stress hormone) once that is lowered then it should be alot easier to get your child to sleep. Some foods have a high melatonin level in them also. Unfortunately there is no sure fix cure as what works for one may not work for another so you just need to try different things. Routine, routine, Routine...even on the weekends. Once you find the best time for your child then establish a bedtime routine that includes bedtime rituals and quite reading in bed. EVERYDAY. Don't vary off the routine OR you will be starting over at the beginning. It takes 6 weeks or more to see results. Please watch carefully what your children Watch on T.V. or what Music and Games they watch/play. Turn in to your kids. Shelter them from as many triggers as possible. School is Hard enough for them to de-stress from. They need to wind down from everything before the bedtime can be successful. We tried melatonin and it worked great = however after a while I notice that my son started having nightmares. Turns out his grandmother quit using melatonin for the same reason. Not sure why it would affect him differently. We didn't resort to any medication. We took Our son off of gluten and dairy and reduced sugar intake. Like night and day! He's a new kid! Might be worth trying out!